Here is the advertisement flyer for the prototype Bridgemaster from Crossley dated August 1st 1956. Below is the complete text. The “Bridgemaster" is a chassisless type passenger vehicle with independent front suspension, incorporating a low height lightweight body for operation on roads where height is restricted, whilst retaining normal body features with centre gangways in both saloons. The independent front, and patented coil spring rear suspension, provide riding comfort and stability greatly superior to any double-deck vehicle in normal service. For these reasons the “Bridgemaster" will appeal to operators even where its low height is not an essential feature. Chassisless type composed of a box like structure formed by the body together with a front subframe which carries the engine, steering and controls. Single dry plate type with hydraulic operation. Friction area 237 sq. in. 4-speed synchromesh gearbox unit-mounted with the engine, providing four forward speeds and reverse. Reverse has sliding mesh engagement. Ratios; 1st; 4.93:1; 2nd, 2.65:1; 3rd; 1.56:1; 4th, 1:1; reverse, 4,30:1. At the rear of the gearbox is a transfer box which provides an offset drive to the rear axle. The gears are of the single helical spur type, ratio 1:1. Three-piece shaft; front and rear shafts have Hardy Spicer needle roller bearing universal joints; centre section is supported in self-aligning bearings. A torsional vibration transmission damper is provided. Offset, double reduction, spiral bevel and spur gear rear axle. Hubs carried on taper roller bearings. Overall reduction ratio 6.19:1. Independent front suspension incorporating unequal length wishbones and coil springs. The wishbone units are each pivoted to the main front crossmember and the swivel pin bosses by conical rubber bush units. The coil springs are fitted between the lower wishbones and the top of the crossmember with direct-acting telescopic dampers inside the springs. Hubs carried on taper roller bearings. Two radius arms pivoted to the body underframe at their front ends and bolted to a crossmember at the rear which reacts against coil springs. Telescopic hydraulic dampers are enclosed within the springs. The rear axle is attached to the radius arms by inclined sandwich rubber mountings. Foot: Air pressure with hydraulic application to front and direct air pressure to the rear wheels. Hand: Mechanical to rear wheels only. Built up from vertical tube and horizontal gill plate block. 11-00-20, l4-ply rating single front and 9-00-20, 12-ply rating twin rear tyres fitted on three-piece ventilated wheel discs. 24-volt lighting and starting. Equipment includes head, side and panel lamps, horn and stop light switch. Dynamo and axial engagement starter motor. Lead acid batteries. Panel contains, speedometer, oil pressure gauge, air pressure gauge, water temperature gauge, ammeter and indirect illumination with rheostatic control. Horn push, dip and trafficator switch on arm extending from steering column. Integral construction employing the stressed skin principle throughout. Designed to achieve a low overall height for use on roads with height restrictions and at the same time achieve maximum passenger space whilst retaining normal body features. 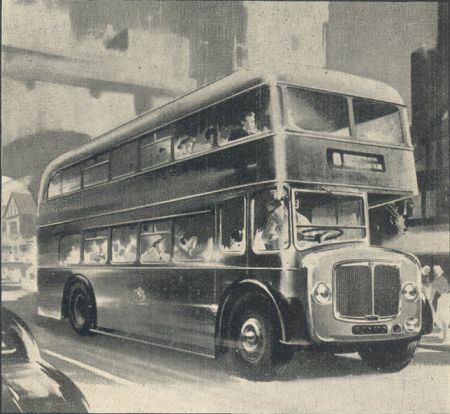 The low height chassisless "bridgemaster" double-decker. 49 BERKELEY SQUARE, LONDON, W.1.